OK so that might be a little far-fetched, but for first time mums TV and movies are sometimes the only reference points for what birth is ‘really’ like. I was watching a movie the other night when pretty much all of the following happened. As ever I was shouting at the TV, so for this post I thought I would compare ‘Movie land births‘ with ‘Reality‘ and dispel some of the myths. Movie-Land Birth: Waters break dramatically immediately followed by an enormous, breath stopping contraction, a contorted face in agony, then another, and another, and another …. Reality: Only about 15% of women experience their waters breaking before labour starts. For the majority of women labour starts with irregular tightenings or contractions, often confused as cramps or lower back ache. These ‘cramps’ gradually get stronger and more frequent as labour progresses. Personal experience: With all my babies I had about a week of stop start contractions. Sometimes going on for 5+ hours so I kept thinking “this is really it” and then it all fizzled out. Movie-Land Birth: Always at a key moment, in a very public place, before labour starts and in a huge embarrassing gush. Reality: For the majority of women there is a slow trickle of water ( the water in front of the babies head) some women just feel like they have wet themselves a little. 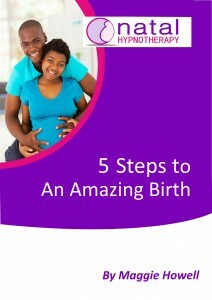 As often waters break during labour you are unlikely to be in a public place but more likely in your own space at home. Some women do experience a big gush of water, but for many its a much slower trickle. You may even find that your waters don’t break until after baby is born (known as en caul). Personal experience: My waters broke before labour really kicked in with only one of my 5 babies. With my first baby I had my waters broken after 14 hours of labour , with 2 of them my waters broke whilst I was already in established labour and continued to trickle for ages and with one of my births the baby was born with the membranes still in tact, only breaking as his head was born. Movie-Land Birth: In many movies the time from waters breaking to having the baby seems to be a matter of minutes, maybe an hour tops. It often includes high-speed journeys to hospital, rushing through hospitals with mum in a wheel chair as she pants clutching onto her bump, whizzed into a delivery room, and voila a few minutes later a baby is born. Reality: For a very few women, birth can be very quick. However again for the vast majority of women (especially first time labours) it is likely to take many hours. In reality this is wonderful, as your body really needs that time to gradually build up the hormones, the elasticity in the cervix and to allow you to enter in to the primal labour land state so your body can just get on with this incredible job. Personal experience: My first labour started in the evening and I gave birth the following evening so over 24 hours BUT so much of that time was spent relaxing and chilling. 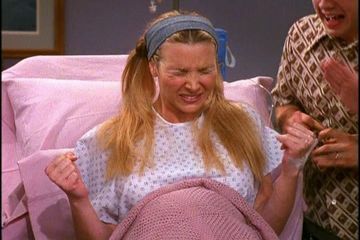 I was contracting every 10 minutes through the night and then every 5 minutes for many hours so actually in total, I had about 2 hours of ACTUAL contractions. For all the others my labours were around 8 hours from beginning to end – but again remember contractions were every 5 or so minutes for much of that. Movie-Land Birth: At any given moment, a woman is usually screaming , shouting, sweating gripping something for dear life and has a look of sheer panic and terror in her eyes! Reality: For the majority of women there is a long build up or milder contractions that enable her to walk around easily and carry on with her daily routine. As things progress she will become more serious and want to focus on her breathing and just letting the contraction pass. Yes she may become vocal as a way of working with the contractions but this is only for the minute of so that she is having a contraction and then there is another lull. Personal experience: I tended to be quite quiet during my labours as I prefered to completely focus on my breathing , on visualisation and on allowing my body to go completely limp. If I had started to shout or scream I would have been introducing more tension in my body which is not very helpful. I don’t remember having any sweat at all! With one of my births I really enjoyed humming at different pitches through each contraction. Movie-Land Birth: Woman is on her back, legs in stirrups with a bright red face and lots of sweat from pushing. Reality : Laying on your back on the bed can actually make labour last longer as you actually have to push baby uphill! Most birth centres will actively courage you to find a position that feels comfortable, even if you have had an epidural. For some women laying down on a side is easier, for some leaning against a door or kneeling on all fours. You may find that being in the water helps. The key to YOUR BIRTH is finding out WHAT WORKS FOR YOU and following your instincts as much as possible.! 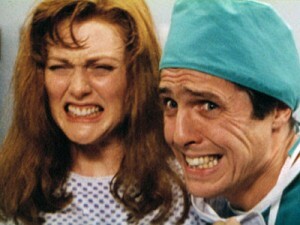 Movie-Land Birth: Medical lead announces that woman is fully dilated and should start to push. 3 big pushes with chin on chest, in a hospital bed, with a chorus of birthing cheer leaders and baby pops out to big cheers. Reality From the time that your cervix starts to open to the point that it is open large enough to allow your babies head to pass through, your body has put in a tremendous amount of effort. Your uterus then needs to shift a gear and start the incredible process of pushing your baby out of the birth canal. Sometimes the body needs some time to rest and then gather up its energy to start the next phase so there can be a lull known as the “rest and be thankful” phase. Also, depending on the position of you and your baby, the time it takes to ease your baby down and out of the birth canal can be anything up to a couple os hours. Personal experience: My 1st labour was the longest (no surprise there) with a distinct overlap between the opening contractions and the pushing down ones. The actual pushing stage was very short – about 7 minutes. With the others I was not examined in the later stages so just went with my body and again there was overlap so I was not aware that I was fully dilated. For all mine the pushing stage was relatively short. So remember that pretty much EVERYTHING you see on TV around birth is created as part of a programme or film that is fundamentally about entertainment and ratings. The kind of births that most women have are not really that exciting to watch for hours on end (well I find them amazing and fascinating but Im a bit of a birth junkie!). To help get a more positive perspective of birth, you can watch lots of amazing births on you tube which show women in a really different light to the ones depicted above. Want to find out how to avoid the blockbuster style birth?